Starting out as what seems to be a political film about the war on terror, Essential Killing slowly reveals itself to be nothing of the sort. A tight, fast moving thriller of utmost simplicity, this is a white knuckle ride of a film, albeit one that is eventually undermined by its own minimalist philosophy. After killing three American soldiers in a tense encounter in an unnamed desert, Mohammed is captured and sent to a detention centre where, dressed in the familiar orange jumpsuit, he is waterboarded and interrogated - leashed, snarling dogs never more than a couple of feet away - in an intense sequence that is a harbinger of what is to come. Shackled and taken on a plane to a country of snowbound forests, Mohammed is driven to a terrifying fate in one of the "black site" camps rumoured to be run by US forces in Eastern Europe. But on the way the truck he is being transported in crashes and overturns, and Mohammed escapes into the night. What follows is an almost unbearably tense cat and mouse chase across a wintry landscape, part First Blood, part John Buchan novel, filmed with a focus on detail that has you squirming at Mohammed's every agonising, bare-footed step through the freezing snow. Helicopters, dogs and soldiers attempt to track him down, which he evades with a mixture of cunning, luck and some occasionally incredulous storytelling. This doesn't matter though in such an edge-of-your-seat experience, one that moves further away from the horrific realism of the opening scenes into survivalist fantasy with every minute. The narrative is stripped down to the point of minimalism, without even dialogue to break its narrow focus. The only respite are odd, dreamlike sequences that explain Mohammed's jihad with passages from the Koran and glimpses of his former life. As he becomes more exhausted, these begin to seep into his waking world and underline the hopelessness of his predicament. Thousands of miles from home in a hostile country, freezing and starving, with no equipment or even adequate clothing, Mohammed's situation is impossible. Unfortunately this is the case for the film as well, which has backed itself into a corner with no chance of resolution. All it can do in the end is shrug and give up. After the excruciating tension of what came before this is a real let down, the film winding down into slower sequences rather than ratcheting up to a climax. It's a shame because for the most part Essential Killing is an exhilarating piece of cinema, stripped down to raw basics and filmed with the invisible expertise that is the real sign of a master director. Ignore the lazy ending and you have an almost perfect thriller. Great review. Though, personally, I liked the ending. I don't want to do a spoiler so I'll just say the final image is something that has strong symbolism in the Muslim world and many other cultures as well as specific references in Polish cinema. Agree with everything here. Most interesting movie I've seen in awhile and was a personal highlight at Toronto. Very different but I'd warn people expecting a big action movie that it gets pretty existential. 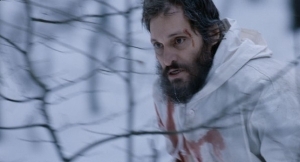 I can see people beyond the Vincent Gallo detractors not liking it. The Polish references that the earlier poster mention go at least back to the writer Adam Mickiewicz and was used in many of Andrzej Wajda's movies. the same Jerzy Skolimowski who's father was a member of the AK and executed by the Nazis and who's family sheltered Jews during the war? Who the New York Time's Manohla Dargis essentially accuses of anti-Semitism for setting Essential Killing "in the kind of woods in which innumerable Jews were murdered during the Holocaust"? By demonstrating bigotry while accusing him of bigotry, you make yourself seem rather primitive.